I designed and built my own Bridgeport milling machine CNC controls (X, Y, and Z axes). The design was based on various elements I learned about from the similar projects others have attempted, with a few of my own improvisations and innovations. Hand-scraped reconditioned table and saddle ways, relined with Teflon. Lead screws upgraded to zero-backlash ballscrews on X and Y.
MCG brand PMDC motors and Renco encoders on X and Y. I used permanent-magnet servo motors as described on my page on MCG (Motion Control Group) PD34002 Permanent Magnet DC Motors. I would not recommend using stepper motors if you want anything but a very slow slew rate. 1/3 HP 1800 rpm PMDC motor (similar to this) and Renco encoder on knee crank for Z axis, stock leadscrew. On X and Y I use a 24L075 timing pulley on the ballscrew shaft. On Z I use a 50L100 timing pulley on the crank. The motors all have a 12L075 timing pulley. This yields a 2:1 ratio on X and Y, and 4-1/6:1 on Z. The X belt is a 150L050, the Y a 270L075, and Z a 345L050. Belt lengths must be carefully matched to the shaft spacing and range of adjustment for the motor. Pulley bore sizes must be either purchased to match the mating shaft sizes, or a purchased as a smaller bore size which you enlarge on a lathe (such as to adapt an inexpensive surplus item). The Bridgeport stock handle shafts on the ends of the leadscrews or ballscrews are all 5/8" diameter with 1/8" square keyways. I collected a wide assortment of pulleys, belts, and motors over a long time from eBay. Having this assortment, I experimented and refined the mechanical analysis to find appropriate ratios and motor sizes. If I were to just buy new items, I would specify the 075 widths (that is, 3/4") on all the belts and pulleys. These parts are widely available, such as from grainger.com, mscdirect.com, or mcmaster.com. The X and Y mounts are made from 4 x 4 x 1/4 square aluminum tube, and the Z mount from 5 x 1.75 aluminum C-channel. I haven't posted my rough pencil drawings here (which were done just before before I started using 3D solid modeling for such things), but from my photos it should be apparent how the attachment holes are cut into the mounts, to mate with the bearing covers in the Bridgeport assembly. Metallic liquidtight flexible conduit (type "UL") between Geckos and brackets. Threaded elbow conduit fittings into holes drilled/tapped into ends of brackets. Wiring in conduit: 12 gage stranded wire for power, CAT-5 cable for signals. Crimp-on spade lugs for power connections (DC power). Phoenix contact 5-conductor plugs/sockets for signal connections (encoders). Heatsinks for Geckos from surplus 486 chip coolers. 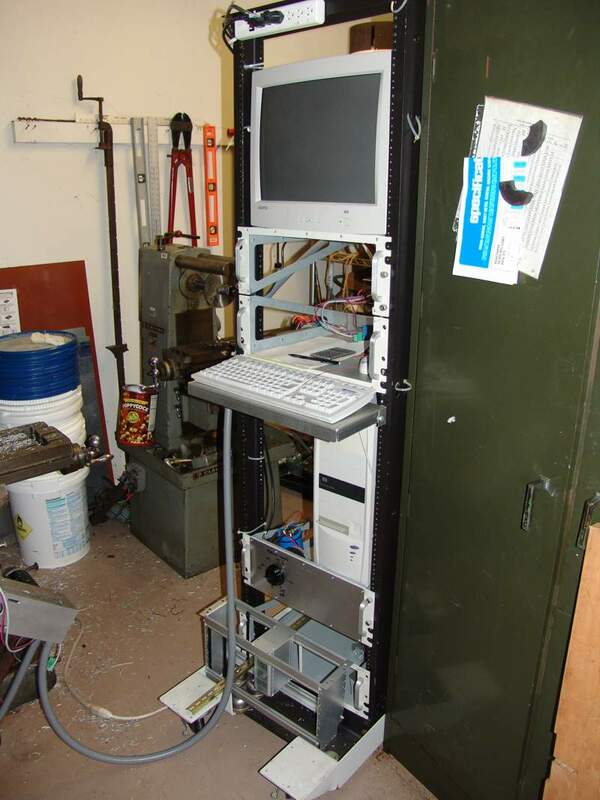 New 84" relay rack on wheels (found in dumpster behind closed Nortel Networks lab!). Sheet-metal rack shelves from surplus Compaq disk server chassis (from eBay). PC running Mach2Mill software under Windows XP. Keyboard shelf from 0.050" aluminum sheet worked on import 30-inch shear/brake/roll tool. Hefty DC power supply (see below made from a toroidal transformer, variable autotransformer, bridge rectifier, and capacitor. Power supply faceplate also from 0.050" aluminum sheet, like the keyboard shelf. Power supply(s) for CNC on this scale are a challenge, because typically you want to drive over a horsepower of peak motive power, and that means kilowatts of 80 volts DC to supply the Geckos. Given that you pay over $1/watt for a laboratory-grade regulated power supply (kilowatts cost kilobucks! ), something simpler and improvised is needed. Initially I obtained some hefty new-old-stock power supplies that ran (get this!) the Cray supercomputers. These boxes were the size of a big textbook, were 5V, +12V, -12V, and 24V floating DC sources, manufactured by Lambda, rugged and reliable, and ridiculously cheap. You could crank up the fine-tuning voltage adjustments of these floating sources, and stack them, to make close to 60 volts out at 8 amps (the current being limited by the lowest-current source in the stack). By using one of these for the X and Y axis motors, and another for Z, I had enough beef for some impressive motion. But these magnificent units featured a whining chorus of muffin fans in them that was like, well, like you were in the holy presence of a Cray supercomputer 25 years ago. I wanted the full 80 volts for the best performance out of the Geckos, but something quieter, and even more gutsy kilowattage. Later I found that other experimenters were building unregulated power supplies based on hefty toroidal transformers with about a 57 VAC output from 120 VAC input. By bridge-rectifying that, you get about 80 VDC out with 10's of amps of current continuous with more amps available for short periods. But those transformers have to be ordered new to get this odd 57/120 step-down ratio, and thus are also expensive, although not as expensive as a regulated power supply of similar capacity. A steady stream of good toroidals appear on eBay for bargain prices, but the problem is that they never have the right ratio. You might commonly find 208/240 or 208/120 (used to step 3-phase legs up or down to single-phase voltages), or 120/240 (US vs Europe converters), or even 1:1 (hospital instrumentation isolation). So it occured to me to follow just about any ratio in a big and cheap toroidal transformer with a variable autotransformer (aka "Variac", an old brand name). The toroidal provides line isolation, while the Variac lets you finely adjust output voltage, and the pair can deliver as much current as the AC line can deliver. Today I use what has to be the cheapest DC watts with variable voltage. A massive toroidal transformer feeds a Powerstat 116BU variable autotransformer. The variable AC voltage goes to a bridge rectifier and then a 1500 microfarad capacitor and panel DC voltmeter. A capacitor this size yields an RC time constant of about 1/60th of a second at 8 amps output, which largely deripples the 120 Hertz rectified AC. I put all this in a surplus rackmount box which is then mounted at the bottom of my CNC rack. You can see the assembly with the black knob on the bottom of the rack shown in the photo above. To power up the CNC drive after the PC is booted, you dial up the Variac while watching the DC voltage until you get to some safe margin under the 80 volt Gecko rating. (I need to add some kind of stop for the dial travel to keep from cranking it higher, to avoid destroying the Geckos.) To shut it down, you crank the voltage back down to zero. Before you turn on the rack mains the next time, you check that someone hasn't inadvertently bumped up the dial! While a given Variac carries a rating for some given continuous current output (a few amps for the small ones, or 10 or 20 amps for the large ones), they can be overloaded up to ten times that much current for brief periods. This is a good match for the intermittent loads that characterize CNC motion. They also have a very low impedance and do not droop the (unregulated) voltage significantly even under heavy load, although the ripple increases. But Geckos do fine with unregulated, ripply power. This overload and low-impedance "gutsiness" is also a feature of toroidal transformers, so the whole system is properly "gutsy" when the servo system needs a few seconds of high current to get the axes moving. The typical lab supply will shut down or blow a fuse in such conditions. All of the above came very inexpensively over time by watching eBay with favorite searches. A new big Variac is well over $100 from distributors like Mouser, but I acquired a collection of them for typical prices of $20 or so on eBay. Using a Variac also means you don't care much what the winding ratio is on the toroidal isolation transformer, since you can adjust the output voltage to what you like. The isolation is needed because autotransformer output is referenced to the line input (not isolated), and feeding this to the Geckos has the potential for a spectacular short circuit, since the Gecko MOSFETS are only isolated from the heat sink and chassis by a thin mica insulating wafer. Another approach to using surplus toroidals might be to remove some of the windings to get the right ratio. They are typically wrapped, lacquered, or potted in a way that makes this impractical. Or go all the way: find a good sized surplus unit, saw off the old windings, and rewind it from scratch with new magnet wire in the desired ratio. 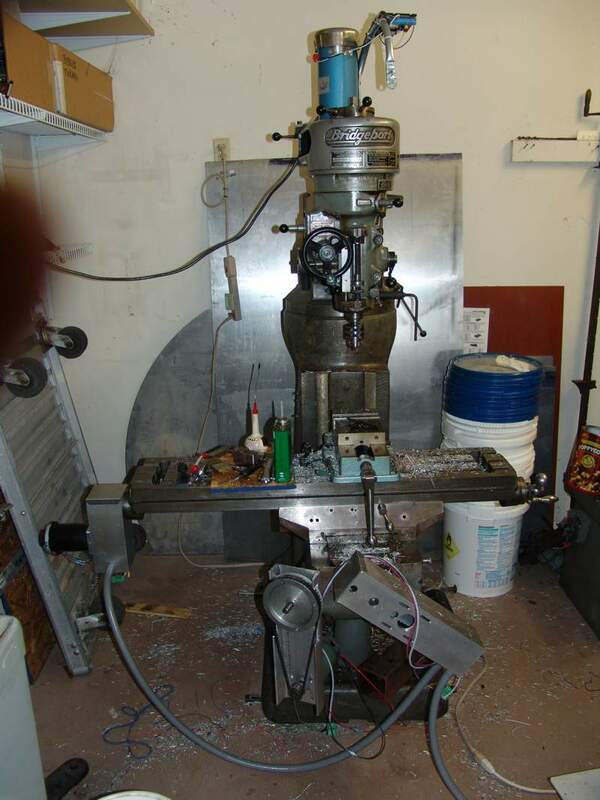 Have a comment or question about my Bridgeport CNC conversion?